A happy, sweet new year! The students at the Rabbinical College prepared hundreds of apple-and-honey packages for distribution across Melbourne. 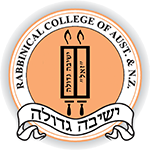 End of year - "Rambam 7:40"
“Rambam 7:40” recently marked the conclusion of its seven month Rambam drive at the Rabbinical College of Australia & NZ (Yeshivah Gedolah of Melbourne), at a Farbrengen held on Motzei Shabbos Chai Elul. Several years ago, the “Rambam 7:40” club was founded by Shluchim of the Yeshivah Gedolah of Melbourne, in order to encourage Yeshivah students to learn the daily quota of the Rambam’s Mishneh Torah (Maimonides' compendium of Jewish law), as per the Rebbe’s instructions. A daily Shiur is delivered by one of the Shluchim during the daily dinner break, at 7:40pm. This year, “Rambam 7:40” enjoyed remarkable success, in no small part due to the vision of Dovi Lesches, a successful real estate entrepreneur based in New York City. At Dovi's insistence, “Rambam 7:40” offered first rate incentives including a weekly pizza lunch (donated in part by Zavdiel’s Vegetarian Pizza & Falafel Bar), a monthly dinner catered by Daneli’s Deli, weekly and monthly raffles with prizes pegged to the amount of attendees, and the year-end grand-prize: A ticket to spend Tishrei in Crown Heights, New York. Over the course of the year, many Yeshivah Gedolah Bochurim (students) participated and became committed to regular Rambam study. The size of the Shiur steadily increased until more than 25 Bochurim were attending daily. Many Bochurim accepted upon themselves a Hachlota (committment) to learning the daily Rambam in the future. The Bochurim celebrated their achievements at a recent Farbrengen conducted on Motzei Shabbos Chai Elul. One of the themes of the Farbrengen was the importance of learning Rambam each and every day, even when time is scarce. Being that “Rambam 7:40” is sponsored in memory of Dovi’s grandparents, Reb Moshe (ben Yishayahu) & Mrs Chana Leah (bas Yishayahu) Lesches, it was fitting that Rabbi Shmuel Lesches (of Yeshivah Gedolah) connected this theme with the commitment of Reb Moshe Lesches in rising at 2:45am every morning to devote several hours to Torah-study before his workday began, and the steadfastness of Mrs Chana Leah Lesches in ensuring the highest level of education for her children, even sacrificing everyday essentials in the process. At the conclusion of the Farbrengen, a Goral (raffle) was drawn by Shliach Menachem Mendel Begun, who coordinates “Rambam 7:40” and delivers the daily Shiur in his uniquely captivating manner. There were 53 entries in the Goral, representing the 23 Bochurim who came to the Shiur for at least one month without missing a single day. The winner of the Goral was Menachem Mendel Rosenbaum, who did not miss more than one day of the Rambam Shiur in the last three months! The students of Shiur Gimmel recently completed Masechta (tractate) Tomid during the afternoon Girsa Seder. They began learning the Masechta in conjunction with the period of the year known as the "three weeks", and spent several weeks learning it in-depth. Their study was highlighted by a daily multimedia presentation prepared exclusively for the Rabbinical College of Australia & New Zealand, which has been developed and enhanced over the last six years. Being that Masechta Tomid focuses on the architecture and daily service of the Beis Hamikdosh, the opportunity to employ visual multimedia technology greatly aided the students in their comprehension of the Gemoro text. Another highlight was a hands-on presentation of the internal anatomy of a sheep, knowledge of which is requisite in order to properly understand a certain section of the Gemoro (Tomid 31a). Special thanks to Rabbi Avremel Krinsky for his help. Students in Melbourne recently ended a year of Mishmor, saying goodbye to bochurim Shluchim of this year and celebrating with a juggling show. This past Thursday (September 15 2011), the Shluchim of Yeshivah Gedolah concluded a very successful year of Mishmor. Every Thursday night (from 7:30 to 8:30), school boys aged 8-13 attend Mishmor at the Rabbinical College. The boys are divided into small groups for a half-hour study session with a Shliach. Studies focus on the Parsha, or the various special upcoming days of the year. The next half-hour is devoted to a riveting story or an exciting game. Towards the end of Mishmor, the boys are quizzed about what they learned, and a video of the Rebbe is shown. Mishmor concludes with a raffle and and a snack. On special occasions, Farbrengens are conducted. The last Mishmor program of 5771 coincided with the conclusion of the two-year term of Shlichus for some of the Shluchim. The boys farewelled their dear Shluchim, with whom they developed such close ties. The boys were rewarded with a special juggling show by our very own Shluchim, Nochum Greenwald and Shmuely Lipskier. The boys had a great time, and are already waiting for the start of Mishmor with the "Shluchim of 5772". At the beginning of 2011, Rabbi Yossi Schneier was appointed to the position of Mashpia (Chassidic guide and mentor), joining Rabbi Yaakov Winner in lecturing and teaching the Chassidus curriculum. With student numbers at capacity levels for the last few years, the need for an additional staff member in Chassidus was necessary. One of the innovations introduced by Rabbi Schneier is a new methodical approach to assist the students’ comprehension and analysis of Maamarim (Chassidic discourses) studied at Rabbinical College. Over the course of the year, Rabbi Schneier compiled and published a series of booklets that classify and clarify the concepts elucidated in each Ma'amar. These booklets are available online, at this link. Future booklets, both updated and new, will G-d willing be posted online as they are published.